Tower Paddle Boards Adventurer 9'10"
The Tower 9′ 10″ Standup paddleboard is extremely rigid with the ability to accept up to 350 lbs, and has the feel of a hard board with no compromise on performance or stability. Its rigid build and increased weight capacity make the Tower SUPs a perfect choice for beginners and tandem users. And the portable and inflatable design means it is very easy to transport and store. Extremely rigid – when the Tower SUP is fully inflated it is very stiff and feels much like a traditional hard board. It has a weight limit in the region of 350 lbs which means it is great for single or tandem use. This board is typically ready to use at 10 PSI (but can be inflated up to 15 PSI). Highly durable – this inflatable paddle board is built with long-term durability in mind and constructed in a military-grade PVC material and secured with drop stitch assembly. This highly durable material is great to protect against board cracks or dings. Portable – the lightweight construction of this iSUP makes it a pleasure to transport or safely pack-away in times of storage. Many of the inflatable boards are no bigger than a rolled up sleeping bag. 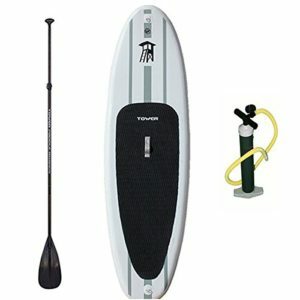 Package deal – this Tower SUP comes as a complete package and includes the inflatable board, fully adjustable paddle and pump. 2-year warranty – to give the guarantee of long-term and dependable service, this SUP is packed with a 2-year warranty that protects against a wide-range of issues except for general wear and tear. Great inflatable SUP, the Tower Inflatable 9’10” is a practical board for relatively flat waters or rivers and gives great stability which is achieved with the long and thick deign. With its solid build, ease in transport and storage and great price, this stand up paddle board is well appreciate for personal use, as well as yoga or paddleboard exercises. The Tower Paddle Boards Adventurer Inflatable 9’10” SUP has established a solid 4.7 out of 5 rating on the Amazon marketplace and provides a really affordable solution to get involved in this water-based activity. Check out this Tower Paddle Board Review as well! Thanks for checking out this Tower Paddle Board Review, please like, share and comment below!